This is a funny one! A dancebot robot called Spazzi. The new fun robot which will dance along to you favorite tunes on a table or your desk, the Spazzi Dancebot robot. Have a look at the video of the Spazzi Dancebot robot in action below, this cool little robot was created by Marek Michalowski and uses Arduino. 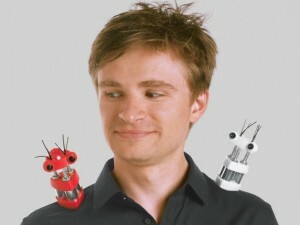 You can find out more information about the Spazzi Dancebot robot over atMake.